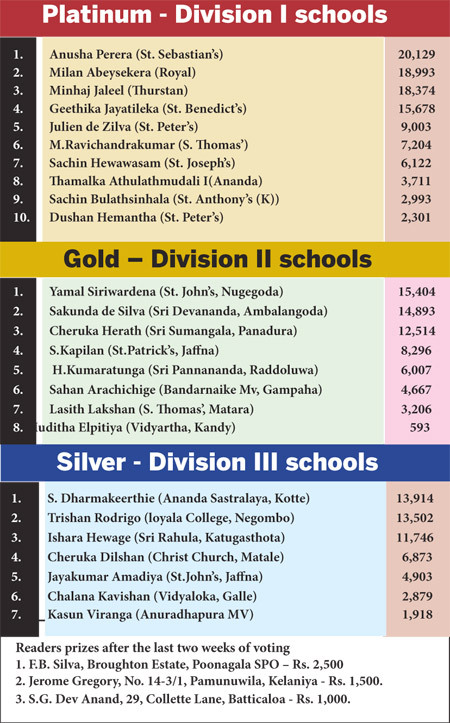 There were no changes in the Silver Segment for schools playing in Division II with Yamal Siriwardena (St. John’s, Nugegoda) occupying the top spot with 15,404 votes and Sakunda de Silva of Sri Devananda College, Ambalangoda at second place with 14,893 votes. There was a new entrant in this segment with Vidyartha College, Kandy’s Muditha Elpitiya filling the 8th position receiving 593 votes. There was a change in the Division III for teams in the Silver segment as Loyala College, Negombo’s Trishan Rodrigo (13,502) who was placed first last week was ousted by Sahan Dharmakeerthie (13,914) of Ananda Sastralaya, Kotte. The difference between the first two, Rodrigo and Dharmakeerthie is 412 votes.